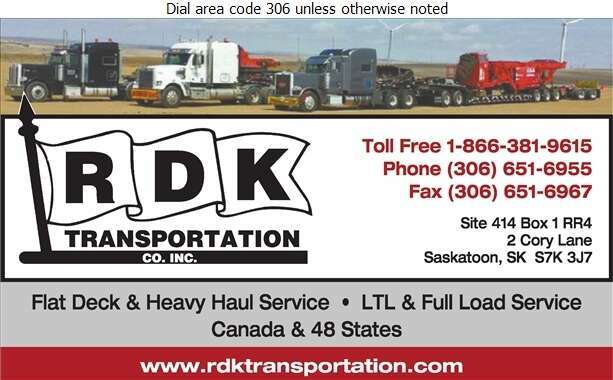 RDK Transportation Co Inc. is ready to assist you with all your transportation needs. We offer a full range of delivery services, including heavy haul and full load service across Canada and the lower 48 states. Our professionally trained staff are held to the highest safety standards. Our fleet includes a large number of Specialized Bulk Trailers, Double Drops, Step Decks, and RGNs ranging from five to eight axles. Regular maintenance guarantees the safety of each shipment. Every delivery is electronically tracked to ensure on-time arrival in accordance with customer specifications. Whether you need a small shipment of materials or a large-scale delivery, contact RDK today for a free estimate.